The rice has been cleared for shipping, because the level of radioactive cesium is much below the national provisional safety limit of 500 becquerels/kg which will pose no threat to health, according to the authorities in Chiba. It's "Koshihikari" brand rice, but since it's not from Niigata the rice may be blended and sold. If it's blended, there is no requirement to state where the rice was harvested. Caveat emptor, except the buyers don't have all information available to them to decide on their own. Chiba Prefecture announced on August 27 that 46 becquerels/kg of radioactive cesium was detected from the rice harvested in Ichikawa City. The prefectural government considers the level as "not affecting health", and has permitted the shipment of the rice as of August 27. In Chiba Prefecture, a small amount of radioactive cesium was detected in the rice before the harvest in Shirai City. The detection of radioactive cesium in rice in Ishikawa City is the second in Chiba, the fourth in Japan. One location in Hokota City in Ibaraki Prefecture and one location in Nihonmatsu City in Fukushima Prefecture also had radioactive cesium in rice. According to Chiba Prefecture, radioactive cesium was detected from the brown rice of Koshihikari taken on August 24 in one location in Ichikawa City. No radioactive cesium was detected in rice in Chiba City, Noda City, Narita City, Choshi City and Asahi City. Rice can be sold and shipped in 42 municipalities in Chiba Prefecture now that the post-harvest testing has been complete and the level of radioactive cesium was below the provisional safety limit. That's what the provisional "safety" limit is there for: to plant the idea in people's mind that anything below that limit is "safe". Clearly many producers and all of government bureaucrats from municipal level upward believe that, and excoriate consumers who still don't buy that argument (and don't buy the produce). TEPCO is trying to explain what happened to Reactor 4 at Fukushima I Nuclear Power Plant. The explanation is that hydrogen gas along with radioactive materials from Reactor 3 flowed to the main exhaust stack, which then flowed backwards from the exhaust stack through Reactor 4's Emergency Gas Treatment System into the reactor building of Reactor 4. To support this hypothesis, TEPCO released this diagram on August 27 press conference, which shows the surface radiation levels of the gas filters. Highest radiation is at the filter closest to the exhaust stack, lowest radiation at the filter closest to the reactor building. Reactors 1 and 3 exploded with explosive sounds that were clearly heard and felt in the nearby towns. But there wasn't any such sound when Reactor 4 supposedly exploded. I say supposedly, because no one seem to know for sure exactly what happened, including TEPCO. Cabinet Secretary Edano at that time said "explosion" of some sort at Reactor 4 on March 15, but the media report was focused on the mysterious "fire" that was spotted by a TEPCO employee who didn't bother to report to the local fire department (as he should have). The fire died down on its own, but then another fire flared up again the next day. The initial report on the Reactor 4 incident was that one or two wall panels in the northwest corner of the reactor building were blown out, and there was some damage on the roof. It sounded minor. Then all of a sudden we were shown the wreckage. One or two wall panels blown out? It was more like "one or two wall panels remaining". Read my earliest post on Reactor 4, on March 15. No photo was released that day. At approx. 6:00am, March 15, an explosive sound was heard and the damage in the 5th floor roof of Unit 4 reactor building was confirmed. At 9:38am, the fire near the northwest part of 4th floor of Unit 4 reactor building was confirmed. At approx. 11:00am, TEPCO employees confirmed that the fire was extinguished. At approx. 5:45am on March 16, a TEPCO employee discovered a fire at the northwest corner of the reactor building. TEPCO immediately reported this incident to the fire department and the local government andn proceeded with the extinction of fire. At approx. 6:15am, TEPCO employee confirmed at the site that there were no sign of fire. It's about time we get the much better, and precise picture of what happened in the early days of the crisis, now that we've been better educated since March 11. The crane was doing the dust sampling on August 24. The crane was doing something else on August 22, when some Japanese watching the TEPCO Live Cam noticed the crane which looked like it was toppling over the reactor building. It did no such thing, it was simply folding. 1. Radioactive strontium came more from Reactor 2 and Reactor 3, 1 to 2-digit higher. 2. More plutonium came out from Reactor 2, 2-digit higher, not from Reactor 3 with MOX-fuel. Neptunium-239, which decays to plutonium-239, was estimated at 7.6 x 10^13 becquerels, or 76 terabequerels, adding to 3.2 x 10^9 becquerels of plutonium-239 that came out. Again, most neptunium-239 came out of Reactor 2, whose reactor building is more or less intact and whose Suppression Chamber is said to have been damaged on March 15 morning. In the PDF file linked above, NISA estimated 770,000 to 850,000 terabecquerels of radioactive materials have been released into the atmosphere from Fukushima I Nuke Plant (although they are now trying to lower that number), and additional 720,000 terabecquerels of radioactive materials are in the contaminated water at the plant. Have these numbers changed over time? If so by how much? I went to look for TEPCO's handouts in the past. In Reactor 1 SFP, the amount of radioactive cesium increased in 2 months, while in Reactor 3 SFP it has steadily decreased. In Reactor 4 SFP the amount is about the same (here's the May analysis). In Reactor 2 SFP the amount is also about the same. If the rice hay had been sitting on the ground since August/September last year and it rained and snowed, wouldn't the rice hay pretty much rot by March this year? Another problem I have is that these cows start to be fed with rice hay one year before they are sold to the market. The cows that were found with radioactive cesium in July were sold and processed into meat between April and July. So they must have been eating rice hay since March - July of last year, and ate the radioactive rice hay for less than 3 months at most. Many cows were sold and processed in April, so they ate the radioactive rice hay for less than a month. It turns out that Miyagi Prefecture is the number one producer of rice hay for cattle feed in Tohoku. Even if the rice hay producers do not roll the hay until it's ready to be shipped, I would think they keep it indoors at all times. The government says it's the rice hay that contaminated the cows, the media outlets say so too. Producers, wholesalers and retailers of domestic beef all say so. Prime Minister Kan finally steps down now that the renewable energy legislation has passed, the ruling party Democratic Party of Japan (DPJ) is going to hold an election to select the next party leader who will be the new prime minister of Japan. The election is to be formally announced on August 27, and the voting will be on August 29, according to Jiji Tsushin (8/26/2011). Jiji reports that there will be 5 candidates for the job. But it seems to boil down to two leading candidates backed by two warring factions within the DPJ. On one side is Seiji Maeda, 49 years old former Minister of Foreign Affairs, backed by PM Kan and his faction. On the other, Banri Kaieda, 62 years old Minister of Economy, Trade and Industry, backed by the faction led by Ichiro Ozawa and ex-PM Yukio Hatoyama, both of whom like to be the "king maker". Banri Kaieda has been an unabashed proponent of nuclear power as the Minister of Economy, Trade and Industry that oversees the nuclear industry in Japan. Not to the extent that may cause "chaos" as Professor Kosako predicted, but the prefectural authorities have tested the early harvest and radioactive cesium has been found in Ibaraki and Chiba. The first to find radioactive rice was Ibaraki Prefecture, but the governor vows to fight the "baseless rumor" to promote rice from his prefecture. As the brown rice grown in Hokota City in Ibaraki Prefecture was found with radioactive cesium, Governor of Ibaraki Masaru Hashimoto answered the reporters on August 19 and said "There is no problem with safety. After the formal testing is complete by the end of August, we will persuade the consumers that there's nothing to worry about consuming Ibaraki rice", and that he will do his best to counter the "baseless rumor". Governor Hashimoto emphasized safety by saying "It is not the level to worry, even if you eat [the rice] for one whole year". At the same time, he said "Since radioactive cesium has been detected in vegetables, I wouldn't have been surprised to see it detected in rice". Radioactive cesium was detected in the brown rice in the preliminary testing. Total 52 becquerels/kg of radioactive cesium was found, with 23 becquerels/kg of cesium-134 and 29 becquerels/kg of cesium-137. The amount was far below the national provisional safety limit (500 becquerels/kg total radioactive cesium). Governor Hashimoto is a former career bureaucrat and a graduate of Tokyo University. Next to detect cesium in rice was Chiba. Chiba Prefecture announced on August 25 that 47 becquerels/kg of radioactive cesium was found in the mochi-rice (glutinous rice) grown in Shirai City in Chiba Prefecture in the preliminary test before the harvest to survey the effect of radioactive materials from the Fukushima I Nuclear Power Plant accident. The amount of radioactive cesium was far below the national provisional safety limit (500 becquerels/kg). It is the second case of radioactive cesium detection in the country, the first one being in Hokota City in Ibaraki Prefecture. According to the division for safe agriculture promotion in Chiba prefectural government, the brown rice taken at two locations within Shirai City on August 22 was tested. From one location, 47 becquerels/kg of radioactive cesium was detected, with cesium 134 22 becquerels/kg and cesium-137 25 becquerels/kg. The prefectural government plans to conduct the full survey on the brown rice after the harvest by the end of August, and if the rice tests under the provisional safety limit it will be allowed to be shipped. But in Fukushima, hardly any radioactive cesium was detected in the early harvest rice. Fukushima Prefecture announced on August 26 the test results of the early-harvest rice harvested in a location in Nihonmatsu City, two locations in Motomiya City, and one location in Koriyama City. From the location in Nihonmatsu City, 22 becquerels/kg of radioactive cesium was found. No radioactive cesium was detected in all the other locations. Based on the results, the prefectural government has allowed the rice harvested in these locations, except for one in Motomiya City, to be shipped. It will be the first shipment of rice from Fukushima after the Fukushima I Nuclear Power Plant accident. According to Fukushima Prefecture, two types of early-harvest rice harvested on August 25 and 26 were tested. When the rice in the Nihonmatsu City location was milled, no radioactive materials were detected. As to the location in Motomiya City (Arai-mura), the testing was done on all rice fields. If the results show the level of radioactive cesium is less than the provisional safety limit, the rice will be allowed to be shipped. These cities are located in "Naka-dori" (middle third) of Fukushima Prefecture where highly radioactive rice hay has been found. 500,000 becquerels/kg of cesium was found in rice hay in Koriyama City, and in Motomiya City, 57 kilometers west of Fukushima I Nuke Plant, the number was even higher at 690,000 becquerels/kg. TEPCO announced on August 26 that the contaminated water treatment system at Fukushima I Nuclear Power Plant stopped temporarily. The pump that transfer the treated water from Kurion's cesium absorption system to AREVA's co-precipitation system stopped automatically at 2:21PM. The treatment system last stopped on August 12 due to the abnormal signal from the control system. TEPCO thinks the stoppage this time is due to too much load on the pump, and is currently looking into the cause. The government officials are slowly finding out the extent of radiation contamination all over Japan, and here are only two minor examples that I picked up today. First, from Mainichi Shinbun Hokkaido local version (7/23/2011; sorry old news that I just found), I learned of the potentially radioactive beef from Hokkaido, which has largely escaped the radioactive plume blowing from Fukushima I Nuke Plant. The cows in Hamanaka-cho ate the rice hay from Wakuya-cho in Miyagi Prefecture that was contaminated with 1886 becquerels/kg of radioactive cesium, the level of which exceeded the national provisional safety limit for cattle feed (400 becquerels/kg). Hamanaka-cho is located on the eastern tip of Hokkaido, facing the Pacific Ocean. Hokkaido officials are perplexed. "We never thought possible that anyone would buy rice hay from Honshu, because it's too costly." It was beyond their expectation. The second one is the radioactive manure in Yamagata Prefecture. According to Sankei News (8/25/2011), the Yamagata prefectural government announced on August 25 that the cow manure at 7 cattle farms in the prefecture tested between 500 to 2600 becquerels/kg of radioactive cesium. All 7 farms were feeding their meat cows with rice hay from Miyagi Prefecture. What I don't understand is why these farms even bought rice hay from Miyagi Prefecture, when their own prefectures are big producers of rice and there should be rice hay in abundance. Well, since the leaf compost made out of radioactive dead leaves in Tochigi Prefecture can be mixed with dead leaves imported from Thailand and Bangladesh and sold all over Japan by one company, anything is possible. 16,500 becquerels/kg of radioactive cesium, and the park officials and the Kawasaki City government are at a loss what to do. They don't know where it came from, they don't know what to do with it. On August 18, the sludge by the swimming pool in Hirama Park in Kawasaki City was also found with 12,400 becquerels/kg of radioactive cesium (see my post here). The air radiation level near the compost was 0.90 microsievert/hour. Following Hirama Park in Nakahara-ku, Inada Park in Tama-ku in Kawasaki City has also shut down the swimming pool because of the high air radiation level. Residents are surprised at the radiation contamination in their neighborhood, and the city officials are at a loss what to do. The national safety limit for radioactive sludge is 8,000 becquerels/kg for disposal. But 16,500 becquerels/kg of radioactive cesium, more than twice the national limit, was detected in the sludge near the swimming pool entrance. The swimming pool is used by about 200 children per day during the summer break. Some cloth and paper were found mixed in the sludge, and the Tama-ku center for roads and parks says it doesn't know where the sludge came from. Cleaning contractor who cleans the parks and the pool staff say they don't know either. It is unlikely that the sludge was from the swimming pool, according to the officials. A citizens' group called "Peace and Smile Project Kawasaki" has been measuring the air radiation levels in Inada Park. One member says he was surprised. "My child comes to this park and use the swimming pool, so I measured several locations and found very high radiation far exceeding the normal level." He also says, "Kawasaki City is also measuring radiation, but the city is focused on locations with fallen leaves, and Inada Park was not included. I hope they measure more locations from now on." One of the city officials who were measuring the air radiation at the site was totally at a loss. "We thought [the high radiation] was caused by fallen leaves. But it wasn't the fallen leaves. How much more should we investigate? We're confused because this is so beyond our expectation. If we expand the survey to many more locations, our regular daily work will be affected. To be honest, we would like the national government to do the survey". The radioactive sludge at both parks were found by this volunteer group "Peace and Smile Project Kawasaki". Looking at their tweets on the Hirama Park sludge, the group has had such a struggle with the bureaucracy at the city offices and the Board of Education in Kawasaki City, who would rather not know about anything like highly radioactive sludge in the park. At one point, it seems the city was just going to have the sludge removed by a contractor and have it disposed as regular waste. The rest was either blown off to the ocean or landed somewhere else in Japan. Researchers at the National Institute of Environmental Studies (NIES) had their paper published in the electronic version of "Geophysical Research Letters" published by the American Geophysical Union on August 11, and they announced the result of their research in Japan on August 25. The paper was submitted on June 27, and they kept quiet until the research was published. The researchers at this government institute therefore knew all along how bad the contamination was all over southern Tohoku and all of Kanto and part of Chubu. To understand the atmospheric behavior of radioactive materials emitted from theFukushima Daiichi nuclear power plant after the nuclear accident that accompanied the great Tohoku earthquake and tsunami on 11 March 2011, we simulated the transport and deposition of iodine-131 and cesium-137 using a chemical transport model. The model roughly reproduced the observed temporal and spatial variations of deposition rates over 15 Japanese prefectures (60–400 km from the plant), including Tokyo, although there were some discrepancies between the simulated and observed rates. These discrepancies were likely due to uncertainties in the simulation of emission, transport, and deposition processes in the model. A budget analysis indicated that approximately 13% of iodine-131 and 22% of cesium-137 were deposited over land in Japan, and the rest was deposited over the ocean or transported out of the model domain (700 × 700 km2). Radioactivity budgets are sensitive to temporal emission patterns. Accurate estimation of emissions to the air is important for estimation of the atmospheric behavior of radionuclides and their subsequent behavior in land water, soil, vegetation, and the ocean. No other nuclides are discussed in the paper. But just for these two, if you look at the deposition and concentration simulation maps below, you see that at least half Fukushima Prefecture is "red", not just along the coast, which means the highest deposition of both iodine-131 and cesium-137 in high concentration. Southern Miyagi is just as bad as Fukushima , so is part of Ibaraki and Tochigi. Now that their paper has been safely published, I wonder if these researchers will speak up (or the government will allow them to speak up) on the subject of radioactive contamination in much of Tohoku and Kanto. I doubt it, but I hope so. I wish they had spoken up much earlier, but I understand that having their paper published by a prestigious foreign academic society is very important for a scientific researcher. plus cesium-134 (half-life of about 2 years) and silver-110m (half life about 250 days). Strontium-90's half life is about 30 years. China's State Oceanic Administration announced on August 24 that strontium-90 was detected in the firefly squid caught off the coast of Fukushima Prefecture in the amount that was 29 times as high as the marine organisms along the coast of China. Cesium-134, which is normally never detected in the marine organisms along the coast of China, and silver-110m, a gamma-ray emitter, were also detected. The State Oceanic Administration considers that "the western Pacific Ocean to the east and southeast of Fukushima Prefecture has been clearly affected by the nuclear plant accident" and has ordered the related agencies to strengthen the inspection of the marine products off the coast of Fukushima for radioactive materials. On August 15, China's State Oceanic Administration announced that the evidence their survey ship had collected off the coast of Fukushima indicated a much wider contamination of the Pacific Ocean than the Japanese government had admitted so far. If the firefly squid was caught in this survey, they are talking about the Pacific Ocean 800 kilometers east of the Fukushima coast. even if they don't do any decontamination. Well I guess they don't buy the argument of Russian scientists about the "ecological half life" of radioactive cesium in Chernobyl area being 62 to 420 years. 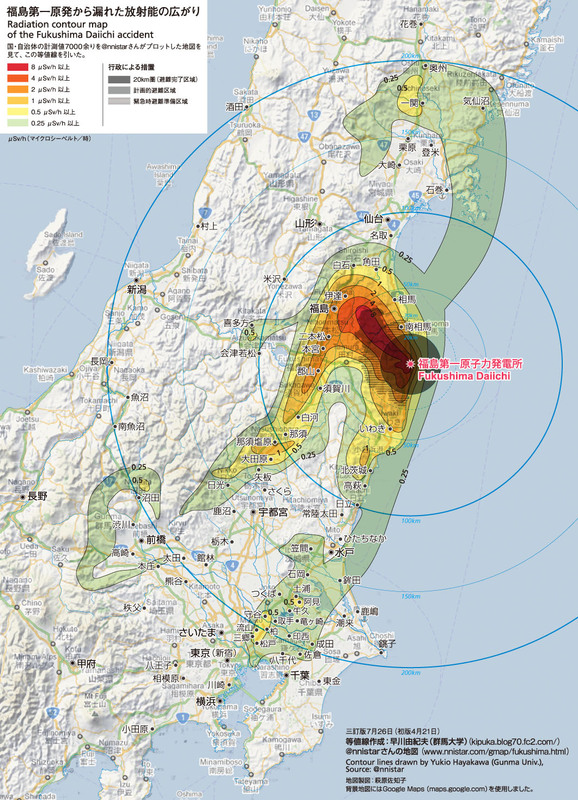 The Nuclear Disaster Countermeasures Headquarters of the Japanese government reported its plans on how to predict the future radiation levels in the area around Fukushima I Nuclear Power Plant to the Nuclear Safety Commission on August 24, and the Commission approved. According to the NSC, in the fields around the plant, the calculation shows the radiation will decrease by 40% in two years even without decontamination. The national government will determine its basic policy on decontamination of the area around the plant, and this calculation will be used as a guide. The Countermeasures Headquarters focused on cesium-134 and cesium-134 among all the radioactive materials being detected around the plant, because they have longer-lasting effects. The calculation was based on radioactive cesium deposited in the fields from the past nuclear tests. Cesium-137, whose half life is about 30 years, would be half in 18 years considering the effect of dispersion by rain. Radioactive iodine whose half life is short and currently is not detected, and radioactive strontium which has little impact on the radiation level are not to be considered. If they have decided to ignore strontium, it's safe to assume they have also decided to ignore plutonium or any other alpha and beta emitters. When they say radiation, it most likely means "air radiation". Mainichi Shinbun also reports on the "Fukushima decontamination task force" set up by the national government. (Note that it's only for Fukushima Prefecture.) The key members of this task force are: the Ministry of the Environment, the cabinet office, and the Japan Atomic Energy Agency (JAEA) which is governed by the Ministry of Education and Science and the Ministry of Economy, Trade and Industry. According to Mainichi, this powerful trio doesn't even know how to do decontamination yet. The trio is going to figure that out by experimenting in the area with relatively high radiation (e.g. Date City in Fukushima) to establish the official decontamination procedure and advise the municipalities. Now I'm beginning to think that the regulatory agency for the nuclear industry being moved to the Ministry of the Environment was for a very good reason but not the government's stated reason of minimizing the collusion between the nuke industry and the regulators. The Ministry of the Environment has made it sound like it resents having to have the nuclear regulatory agency under the ministry. Au contraire, I think. Here's the big chance for the minor ministry like the Ministry of the Environment to become a major player by leading the effort on decontamination, which is what the government has clearly decided to promote big time. The Ministry already has its vested interest group - the waste management industry which is going to play a very, very big role in the "cleanup" of 30 years or so worth of debris with varying degrees of radioactive contamination in Tohoku area. The Ministry has its own set of "experts" who will advise on decontamination and cleanup. If anyone has accumulated a workable decontamination plan and method, that would be the Radioisotope Center of Tokyo University under Professor Kodama. But no, the national government has its own ideas, and the JAEA, of Monju notoriety, will be in charge. 35 Prefectures from Hokkaido to Kagoshima; in other words, all over Japan. Good news for the residents of 4 cities in Ishikawa Prefecture who do not want radioactive debris burned in their neighborhood: the cities have suspended the decision to accept disaster debris because of the opposition from the residents, even though city officials are quite willing to accept debris to "help" Tohoku. Why these officials want to "help" Tohoku by soiling their beautiful, historical cities with radioactive materials, however small, remains a mystery to me. The only answer that I can think of is what Haruki "Detarame" Madarame of the Nuclear Safety Commission said - "It's all about money, isn't it?" For all the other cities and prefectures, residents beware. Beware of the mass media too, who is very quick to mislead by branding the residents as "selfish" and "uncaring" for refusing to burn the radioactive debris. Or firewood. Like a heap of abuse dished out to Kyoto City residents. Glancing through the tweets of people in Japan knowledgeable about waste management, I'm beginning to realize that there is a figurative "waste management village" whose residents are made up of experts, industry people, government officials with vested, common interest in promoting waste processing facilities - just like the "nuclear power plant village" that may or may not be unraveling. New Word to Learn for Non-Japanese Speakers: "Dango"
"Dan-goh", with the second syllable pronounced long. If you pronounce it short, it will mean "sweet rice-flour dumplings", which look like these in the photo. So what is "dango"? It is a long-standing business practice in Japan across many, many industries but particularly heavily used in the construction industry whereby the competitors get together and arrange who will win the bid and at what price. It's a fine example of "give and take", or "I scratch your back and you'll scratch my back later". A contractor who is not to get the job this time is scheduled to get the next one, or a contractor who is to get the job promises to subcontract or form a joint venture with a competitor. No one will underbid. Industrial harmony. The winner is pre-selected, and to make up the appearance (and to make the selection committee look like it is doing the job) the bidders often craft their bids that are intentionally inferior to the bid by the pre-selected winner. In exchange for the orderly market, it usually ends up costing the taxpayers a bit more and enriching those local government officials with strong ties to these colluding companies. Now, Miyagi Prefecture, whose governor's idea of "recovery" is to build a memorial museum and memorial park for the March 11 disaster, has started to solicit bidding on the disaster debris cleanup jobs. With huge amount of money to be spent freely (remember, now it's the national government paying for the cleanup) to the tune of 240 billion yen (US$3.13 billion) - the largest project size for Miyagi Prefecture - the nation's construction industry got in shape quickly to do the "dango" to divvy up the money and help clean up the disaster debris, which is likely to be pretty radioactive. Radiation? What radiation? We have the "dango" to do. Miyagi Prefecture announced on August 23 that the cleanup of disaster debris in the Ishinomaki district will be awarded to the joint venture of 9 companies headed by Kajima, one of the largest general contractors in Japan. The project cost will be about 240 billion yen [US$3.13 billion], the largest ever for the prefecture. The selection committee made of experts chose between the two joint ventures who submitted the proposals. The prefecture was reportedly informed of a "dango" taking place, where the Kajima JV's winning the contract had been predetermined by the participants even before the proposals were submitted to the selection committee. Miyagi Prefecture has 15 million tonnes of disaster debris, which is equal to 23 years worth of regular garbage in the prefecture. More and much more to come. The debris cleanup, which was going nowhere at all after 5 months since the March 11 triple disaster, will be done very quickly now that the big contractors are assured of the big money. Already, also in Miyagi Prefecture, a big paper company has signed a contract with the prefectural government to burn the disaster debris for the company's thermal power generation to power the company's plant in Ishinomaki City. The excess electricity will sold to Tohoku Electric, according to Kahoku Shinpo (in Japanese; 8/23/2011). They're going to burn the radioactive debris to generate electricity, and they will get paid for taking the debris as fuel. And these general contractors in joint ventures will burn, bury, and burn more, with the help of junior JV partners which often include small construction firms owned and operated by the senior officials in the local municipalities, including mayors. The other JV who supposedly lost out on this bid will surely get their job for the next round of disaster debris cleanup, because that's the whole point of "dango" - secure job for everyone, over time. Professor Kodama of Tokyo University warned against this very "dango" in his testimony in the Diet. Ah but Japan is finally on the way to recovery. "Dango" collusion is back! Radioactive or not. Part of normal daily life as we've seen at Fukushima I Nuclear Power Plant. The stainless pipe that circulates water for the condenser unit for the Spent Fuel Pool of Reactor 4 has been found leaking. The amount of radioactive materials in the water (coming out of the SFP) is very low, says TEPCO, only 10 becquerels/liter. It is a very minor drip, of one drop in 30 seconds or so, according to Mainichi Shinbun (in Japanese; 8/23/2011). TEPCO's countermeasure is to put a bucket under the dripping pipe. The cooling operation continues uninterrupted. (UPDATE) TEPCO's Matsumoto seems to think the high radiation was caused by "a few grams of radioactive cesium", according to Mainichi Shinbun (8/23/2011). TEPCO has a simple diagram to explain the super-hot 3 sieverts/hour radiation on the drain pipe of Toshiba's SARRY, not the main pipe that feeds contaminated water to the vessels. It was all too clear from the press conference that TEPCO didn't even know for sure. They were guessing that's what was, which was the fluctuating water pressure during the flushing caused the float to bob up and down (see the TEPCO diagram below), which in turn caused the water with highly radioactive sludge to be sucked out into the drain pipe. Why did TEPCO think that was the cause? Because after they blasted the drain pipe with water the radiation level got lower, so it's got to be the sludge in the pipe. Therefore, their countermeasure is going to be to close off the valve at the vessel so that the contaminated sludge from the vessel doesn't flow out to the drain pipe. Looks like a basic design flaw to me, but who am I to say? (UPDATE) According to the plant operator Dominion's press release, the external power has been restored. The release doesn't say what time it was restored. One of the diesel generator was taken offline after the generator coolant leaked, but the 5th generator at the plant took its place. There has been no leak of radioactive materials in the environment other than that during the normal operation. A nuclear power plant located in Louisa County, the epicenter of the earthquake in Virginia, has shut down. The North Anna Power Station, operated by Dominion Power, has two reactors. The plant declared an "unusual event" in the wake of the 5.9 magnitude quake, which is the lowest stage on the plant's emergency scale. As a result, the plant has been shut down. Check back with NBC Washington for more updates as they become available. The AP reports the plant is being run off of four emergency diesel generators, which are supplying power for critical safety equipment. SARRY, a cesium absorption system in the contaminated water treatment complex at Fukushima I Nuclear Power Plant was stopped when the extremely high radiation of 3 sieverts/hour was detected during the operation to exchange the cesium towers. TEPCO announced on August 22 that a high radiation of about 3 sieverts/hour was detected at Toshiba's SARRY which was recently introduced as part of the contaminated water treatment system at Fukushima I Nuclear Power Plant. Due to the high radiation, TEPCO could not exchange parts [cesium towers], and the water processing [using SARRY?] had to be stopped. SARRY started the full operation on August 18. According to TEPCO, workers were exchanging the parts that absorb cesium for the first time in the morning of August 22, when they found a spot with high radiation on a pipe in the system. Unless the radiation level gets lower, the workers cannot exchange the parts. TEPCO is trying to flush out the radioactive materials in the pipe with water. So, as with Kurion's system, Toshiba's SARRY also needs human intervention to exchange highly contaminated cesium absorption towers. Toshiba's towers supposedly have built-in lead sleeves inside the towers, but it is the pipe that's radiating 3 sieverts/hour radiation. Oops. When it comes down to, it is the basic items like pipes, pipe fittings, hoses and pumps that give. "Ecological Half Life" of Cesium-137 May Be 180 to 320 Years? A Wired Magazine article dated December 15, 2009 cites a poster session presentation of the research of the Chernobyl exclusion zone at the American Geophysical Union conference in 2009, and says radioactive cesium may be remaining in the soil far longer than what the half life (30 years) suggests. To note: it was a poster session presentation, and I'm looking to see if it has been formally published in a scientific paper since then. SAN FRANCISCO — Chernobyl, the worst nuclear accident in history, created an inadvertent laboratory to study the impacts of radiation — and more than twenty years later, the site still holds surprises. Reinhabiting the large exclusion zone around the accident site may have to wait longer than expected. Radioactive cesium isn’t disappearing from the environment as quickly as predicted, according to new research presented here Monday at the meeting of the American Geophysical Union. Cesium 137’s half-life — the time it takes for half of a given amount of material to decay — is 30 years. In addition to that, cesium-137’s total ecological half-life — the time for half the cesium to disappear from the local environment through processes such as migration, weathering, and removal by organisms is also typically 30 years or less, but the amount of cesium in soil near Chernobyl isn’t decreasing nearly that fast. And scientists don’t know why. In 1986, after the Chernobyl accident, a series of test sites was established along paths that scientists expected the fallout to take. Soil samples were taken at different depths to gauge how the radioactive isotopes of strontium, cesium and plutonium migrated in the ground. They’ve been taking these measurements for more than 20 years, providing a unique experiment in the long-term environmental repercussions of a near worst-case nuclear accident. “I have been involved in Chernobyl studies for many years and this particular study could be of great importance to many [Department of Energy] researchers,” said Faybishenko. The physical properties of cesium haven’t changed, so scientists think there must be an environmental explanation. It could be that new cesium is blowing over the soil sites from closer to the Chernobyl site. Or perhaps cesium is migrating up through the soil from deeper in the ground. Jannik hopes more research will uncover the truth. “There are a lot of unknowns that are probably causing this phenomenon,” he said. Citation: “Long-Term Dynamics of Radionuclides Vertical Migration in Soils of the Chernobyl Nuclear Power Plant Exclusion Zone” by Yu.A. Ivanov, V.A. Kashparov, S.E. Levchuk, Yu.V. Khomutinin, M.D. Bondarkov, A.M. Maximenko, E.B. Farfan, G.T. Jannik, and J.C. Marra. AGU 2009 poster session. whose bark was found with 1,130 becquerels/kg of radioactive cesium. A Sakai City, Fukui Prefecture-based NPO "Fukui Disaster Volunteer Net" has been selling the Buddhist rosaries and bracelets made out of the core of the trunk of the pine trees that was felled in the March 11 disaster in Rikuzen Takat City in Iwate Prefecture. The firewood made out of those pine trees was to be used at "Gozan no Okuribi" in Kyoto, but radioactive materials were detected [from the bark of the wood]. There was no radioactive cesium detected from the core. Misao Higashikado of "Fukui Disaster Volunteer Net" says his organization wants to support the recovery by [commemorating the disaster] using the safe part of the wood. One bead of the rosary/bracelet is engraved with "3.11", so that the memory of the disaster does not fade away. The NPO started to sell the rosaries/bracelets on the internet in late July. After the "Okuribi" on August 16, the NPO asked Ibaraki University to test for radiation, but there was no radioactive cesium detected from the trunk of the tree. A Buddhist rosary sells for 3,000 yen (US$39), and a bracelet sells for 1,800 yen (US$23). Disaster capitalism alive and well. Oh wait, it is not really a capitalism. It's done by an NPO, non-profit organization. I should say "social entrepreneurism", then I'm totally politically correct. "Core Damage comes from a loss of cooling. I know of no report of loss of cooling at that facility. Did they go dark when the one electrical transmission tower fell north of Fukushima during the earthquake? Did they then have a delay if the startup of Emergency Diesel Generators? If there was a delay or if they lost the EDG's totally THEN there might be a melt down, BUT I have not heard of this happening." I didn't know either (or I totally forgot). Did they or didn't they? So I went to TEPCO's site and see what they say. This happened on Reactors 1, 2, and 4, at the same time. So, the reactors weren't cooled for as long as 69 hours in case of Reactor 4, and 55 hours in case of Reactor 1. Is 55 hours long enough for the coolant (water) inside the Reactor Pressure Vessel to evaporate and for at least part of the fuel rods to be exposed and get damaged? For all 4 reactors, the Reactor Coolant Filtering System came online between June 4 and July 17. TEPCO also says the Suppression Chambers of Reactors 1, 2 and 4 suffered some event that caused the "loss of function to suppress pressure" in the morning of March 12. The function was restored on March 14 morning. White smoke seen rising from Fukushima II Nuclear Power Plant in Tomioka-machi after the quake but BEFORE the tsunami. It was related by people (husband and wife) who were in Kawauchi-mura, west of Tomioka-machi, quoting the unnamed acquaintance of theirs who works at the plant. They said they couldn't name the person as he is higher up in the organization. The couple was speaking in an event organized by an independent journalist Yasumi Iwakami.